Play for a child can be defined as multiple things. The main components of play should be movement, creativity and a feeling of enjoyment. Play is one of the most positive things we can experience as children but unfortunately, studies show that children are spending less and less time playing and more time working or spending time in front of a television or other device. 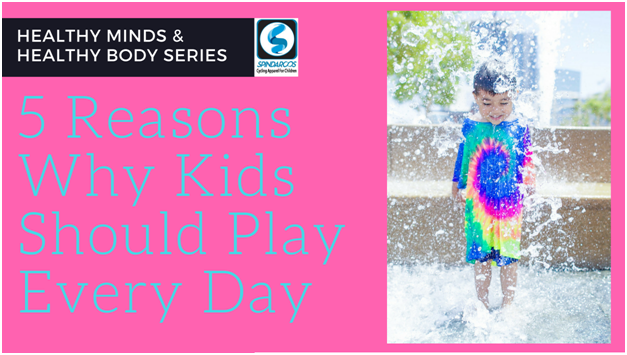 We’ve put together a few reasons why kids should play each day for at least 30 - 60 minutes. It really can make a world of difference to your child. But hey…not only is it important for your child, it’s important for you, as well!! Just because we grow older doesn’t mean we don’t like to partake in fun activities regularly. Running around and laughing with your kids, creating games together and playing sports together can create strong bonds of trust and love within an entire family. So get your kids out there and get yourself out there and PLAY! If that wasn’t encouragement enough, here are 5 reasons to get your kids (and you) out and playing. 1. Confidence - Play helps to build self-esteem and confidence. Children who play on a team often times work better in group environments. When a child learns to work together, they’re instilled with a sense of pride and accomplishment, similar to those feelings you have in the workplace when you’ve finished a team project. It helps prepare them for future endeavors in leisure and in their career. 2. Mental Health - If you’re truly doing something you love, it feels like play. These feelings of happiness and contentment create positive effects in the body and in the mind. Staying active and plain old having fun the perfect way to maintain good mental health. 3. Physical Health - Play means movement and regular movement means living your healthiest life! Running, playing a game of soccer or basketball, or hiking are great ways to maintain physical health. Cycling is the perfect way to be active together with friends or as a family! Cycling is an activity that children and adults both can do together and be enjoyed equally by both. 4. Build Friendships - Laughing and partaking in positive activities is one of the best ways to build strong friendships. Children learn about making friends through play, from infancy through childhood and into adulthood. 5. It’s Just Fun - Play is the best part of every day! Why not play as much as you can? There’s so much pressure on kids in today’s world - help ease that daily pressure by balancing it out with fun and laughter. The stress won’t feel so heavy! While the statistics about kids and play these days are quite discouraging, we have the power to turn those numbers around for our families by building good habits with a recipe of movement, silliness and PLAY!